Welcome to a new year! May 2019 be a wonderful year for you, and I hope everyone stayed nice and warm while celebrating last night. It was certainly a bitter one last night, as some cities in Canada had their fireworks several hours early, so people could go home, out of the cold. At the time of this writing, we are at -26C, with a windchill of -37C. The last few days, when going out in the morning to give the cats fresh food and warm water, I have been finding the water bowl in the sun room empty (except for a cat sitting in it, usually). Last night, the girls went out an extra time to make sure there was water for them. Yup. 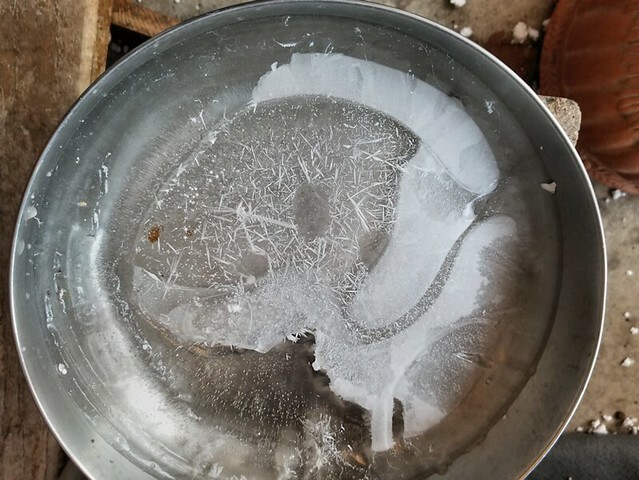 Even with the heat from below, the water froze. You can see where the cats had been drinking, while there was still liquid water to be reached. There is actually some liquid water still in there, but just barely. Nothing the cats could reach through the ice, anymore. The cats seem to be managing all right, though. They seem to be quite adept and finding suitable shelter – there certainly are a lot of places they can keep warm around here. Interestingly, it seems that the colder it gets, the more they have been going under the storage house instead of the sun room. Squiishies of the new year!!! Let me know your thoughts!